Shortly before noon on Friday there was a car accident between an Israeli car and a Palestinian youth on Road 60, near Kiryat Arba. In the accident, the Palestinian youth was severely injured. Following the incident, Arabs gathered at the site and began to riot and attack police officers who arrived at the scene. Despite arrests and attempts to quiet the riots, the Arabs continued to exert violence on police officers, who began to shoot rubber bullets on the rioters, until the crowd eventually dispersed. Israeli security forces are concerned that the security situation is highly volatile leading up to Abu Mazen's speech at the UN this evening. 2 p.m.: Masked Arabs are throwing rocks at Israeli security forces at the Qalandia security checkpoint. 4 p.m. Hundreds of Arabs demonstrated at Qalandia and threw stones at security forces, who responded with crowd control measures. A man in his 30's and a baby were killed after their vehicle overturned on Route 60 near Hebron on Friday afternoon. While police are claiming it was a traffic accident, initial reports from residents who arrved at the scene informed the press that a stone was thrown at the vehicle and caused the accident. This is a summary of events until 4:45 p.m. Israel time. We will pick up again on Saturday night. Shabbat Shalom to all. The unilateral declaration of a Palestinian state is ultimately the creation of another Gaza or northern Lebanon in the heart of Israel. When Israel unilaterally withdrew from Gaza and northern Lebanon, the respective territory became not a basis for an entity that could develop healthy economic, political and social relations with Israel, but rather fertile ground for shooting rockets deeper into Israeli territory and infiltrating its borders to commit acts of violence on civilians--official strategic policies advanced by parties that were democratically elected, i.e. supported by the population, in the case of Gaza. Moreover, as 45 years have passed since the said territory was won by Israel in a war they did not want (keep in mind: Palestinians, along with Jordan, Egypt, Syria, and Lebanon were enemies of Israel prior to 1967, when Israel had those dreamy pre-67 borders), the West Bank is now home to nearly one million Israelis, who have since built vibrant and extensive infrastructure, cities, schools, transportation systems, community centers and agriculture. In the present security context, the declaration of a Palestinian state outside of the context of a peace agreement with Israel is a declaration of war on a sovereign country. On Friday, September 23, Mahmoud Abbas will submit the membership application to the UN Secretary General after his address to the General Assembly. Still, the UN Security Council vote on the bid may be delayed for several weeks. If a vote should happen, the bid would require a majority of 9 out of 15 votes in favor in order to pass. As it stands, out of the 15 members of the UN so-called Security Council, six or seven have pledged to support the Palestinian bid. Palestinian foreign minister Raid Malki said that officials are now busy trying to convince two or three more members in favor of accepting Palestine as a member state. Permanent members: The UN security council is composed of five permanent members: China, France, Russia, Britain and the US. Britain and France have thus far not announced an official position, although have said that Palestinians should approach the EU rather than the UN. China and Russia are likely to support the bid. In other words, the fate of Israel could lie in the hands of a West African nation most people never new existed, with a population of 1.5 million. If Gabon and Nigeria indeed endorse the bid, and if Palestinians (h"v) enlist the support of either Portugal, Nigeria or Bosnia (this article says Portugal is likely to endorse), amounting to a majority in the Security Council, then the US will most likely be forced to use its veto power to kill the motion. However, this still leaves the Palestinians with the option of going to the General Assembly, by invoking Resolution 377, which states that if the Security Council fails to exercise its responsibility for the "maintenance of international peace and security," the General Assembly can in effect bypass the Security Council decision. Legal experts have emphasized that the wording of the resolution does not have the backing of international law, but Israeli officials are not taking chances. Should the Palestinians go to the General Assembly after facing a US veto, they would require two-thirds of 193 votes in order for the membership bid to pass. Some are warning that the Palestinians may bypass the Security Council entirely and head straight for the General Assembly, should their chances there be better. This is where countries like Indonesia come into the picture. And specifically, efforts by countries like Indonesia to not only back the bid, but lobby other countries to support it. On Tuesday, after a meeting with Kazakhstani and Portugese officials, Indonesia's foreign minister announced that the country is actively seeking opportunities to ensure Palestine's bid for UN membership. Also on Tuesday, Indonesian officials upgraded the status of the Mount Tambora volcano to Level 3, after volcano activity increased, raising the risk of the emission of toxic gas to neighboring villages, and forcing evacuations of these areas. The Mount Tambora volcano was responsible for the largest and deadliest volcanic eruption in history, in April 1815, in which nearly 100,000 people were killed. In April, Tambora showed signs of awakening. In August, it made headlins for spewing thick white smoke into the sky. Throughout the month of September, earthquake activity has increased. A bomb went off in downtown Ankara on Wednesday morning, injuring at least 27 people. Turkish officials reported that the blast occurred in a minibus. Deputy Prime Minister Bulent Arinc told Turkish television that the blast was caused by a bomb that was planted in a vehicle. Please like this video and comment on Youtube if you feel so inclined (so far there are far too many anti-Israel comments)! A shallow 6.9 earthquake hit Sikkim, India at 6:10p.m. local time on Sunday evening, killing at least 16 people, toppling buildings, and sending tremors as far as New Delhi, Bangladesh and Nepal. The quake precipitated massive landslides throughout the Himalayan state, cutting off thousands living in remote areas. For those following the relationship between Elenin and recent increased earthquake activity throughout the globe: Elenin is now between the orbs of Mercury and Venus, on its way to align with the Earth, Sun and Mercury on Venus' orb around the Jewish New Year on September 27th. Elenin is currently 0.542 astronomical units from the Earth (the sun is 1 AU from the Earth; during the Japan earthquake, Elenin was 6 AUs from Earth). Now, guess who announced their support of Palestinian state bid at the UN on Friday? India will support a Palestinian bid for membership of the United Nations at a meeting of the General Assembly scheduled for later this month, Foreign Secretary Ranjan Mathai said on Friday...Mr. Mathai told journalists that India “will support the resolution on Palestine seeking membership of the United Nations” and that India was among the first countries to accord the state of Palestine diplomatic recognition when it was proclaimed in November 1988 (The Hindu, Sept. 17, 2011). Earthquakes, Elenin and Eretz Yisrael are all in God's hands. The video below presents a chart made by Luis Vega showing that the dates of Elenin's upcoming alignments with Earth match up perfectly with Rosh Hashana 5772 and the last day of Sukkot 5772. This is particularly interesting in light of the recent announcement that the decree of war has been delayed until after Hoshana Rabbah. Elenin-watchers have drawn parallels between Earth's previous alignments with Elenin and major earthquake activity around the globe. Only the last alignments took place when Elenin's distance from earth was 6 times further than the distance between the sun and Earth; Elenin's next alignment--on Rosh Hashana--will take place when Elenin is midway between the Earth and the sun. On the Shmini Atzeret/Hoshana Raba, Elenin will enter Earth's orbit, which could exert gravitational pull. What will we be doing B"H between these two major alignments? Teshuva, Tefila and Tzedaka. Let's make it count. Note: At the 10-minute mark, the speaker switches from presenting the material to discussing its relevance to Christian doctrine. An explosion at the Marcoule nuclear site in southern France has killed one and injured four. 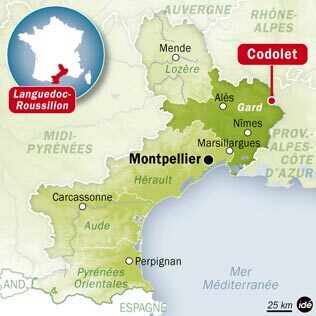 The blast was caused by a furnace fire in a radioactive waste site in the town of Codolet. Officials say there are no leaks of radioactive material, but a security perimiter has been set up around the plant. Update: French emergency services warn of risk of radioactive leak. Today 20,000 protested in Greek's second-largest city, Thessaloniki, in anticipating of the government's announcement of additional austerity measures to avoid a default on the country's debt. Markets plunged on Friday at the prospect of a Greek default, a move that would deal a sharp blow to the European banking sector as a whole. On a positive note, last week Greece's foreign minister Panos Beglitis was in Jerusalem to sign a security cooperation agreement with Israel, on the background of deteriorating relations between Israel and Greece's neighbor, Turkey. Greece also voiced its support of Cyprus' freedom to conduct business with Israel in the Mediterranean last week, in response to Turkish threats on the island country. Perhaps also related to strengthening ties between Athens and Jerusalem, a new law passed in Greece last week grants citizenship to Greek Jewish refugees from World War II. On Friday afternoon, after a rally in Tahrir Square, Egyptians began attempting to break down the wall protecting the Israeli embassy in Cairo. By midnight the mob had broken through the wall and entered the building housing the embassy on the top floors. An hour later there were reports of embassy documents falling from the windows of the top floor, evidently indicating the mob had managed to gain access to the embassy offices. At 2 a.m. Israeli Defense Minister Ehud Barak reported that Israel had appealed to the U.S. for help in guarding its embassy, after Netanyahu's calls to Tantawi went unanswered. At 2:30 a.m. the White House issued a statement that the U.S. is concerned over the storming of the embassy and is taking the necessary steps to prevent further violence. Soon after, the Israeli ambassador and his staff arrived at the airport in Cairo. At 8:30 p.m. Israel time on Saturday, Netanyahu held a press conference in which he personally thanked Obama for calling Tantawi and ordering the Egyptian military to intervene and ensure the security of Israeli embassy staff. Netanyahu confirmed that it was the Egyptian commando which in the end stood between the mob and Israeli personnel--on Obama's orders. This Shabbat, a major crisis was closely averted. Israeli leaders may be simply hoping Turkey backs down, but Israel's military is reportedly taking seriously Ankara's recent threat to send warships to accompany boats to Gaza. 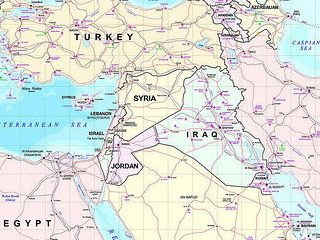 According to the World Tribune, Israeli military sources are preparing for the worst: potential confrontation at sea with Turkey, with Gaza at the focal point. The concern is that Turkey may join forces with Egypt to patrol the Mediterranean with the help of Turkey's naval bases in the region. "They [Turkish warships] will be seen more frequently in those waters," Erdogan said on Sept. 6. "The eastern Mediterranean is not a strange place to us." Erdogan is planning a visit Cairo to discuss "strategic cooperation" with the new Egypt, during which he may make a provocative visit to Gaza with his hosts' help. And earlier today, YNet reported that Turkey is planning on conducting military maneuvers with Egypt in the Mediterranean in coming months. Israel's two best friends in the region -- Turkey and Egypt -- are now turning their backs from her, and to each other instead. The problem is that when Turkey and Egypt turn to each other, that pretty much covers the Mediterranean. Let's pray Israel's leaders begin to take the new Middle East seriously! In Lebanon, Hezbollah	is growing stronger within government arms, but it has not lost its desire to harm Israel, and the ties with Turkey aren't at their best. ...This raises the likelihood of an all-out, total war, with the possibility of weapons of mass destruction being used. Although his comments were approved for the press, Eisenberg was reportedly criticized by defense officials for sharing sensitive security information and "heating up tensions" in the region. What began as a facebook group has turned into the largest social protest in Israel's history: Organizers of the "March of the Million (Tza'adat HaMillion)" knew that getting one-seventh of the population of Israel into the streets was unlikely, but were nonetheless hopeful that the march's slogan would serve to sustain the momentum of Saturday night protests earlier this month in which hundreds of thousands marched around the country. As of 10 p.m. Israel time, 300,000 were reported to be marching across Israel. 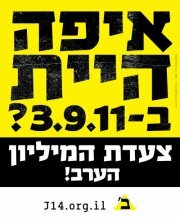 Live feeds of the central protest in Tel Aviv are available on Walla!, YNet, and Channel 2. Update (23:15): The Jerusalem Post reports over 460,000 protesting across the country. Daphni Leef, unofficial leader of the new social movement, spoke of the transition happening in Israeli society from waiting for a change to happen to m aking the change ourselves. May the leaders of this movement be blessed with the wisdom to take this momentum in the right direction! (Hint: check out the title of this blog =0) After all, it's already beginning: A new chant goes: The people...demand...a leader! May the chant reach shamayim! In an interview with Foreign Policy magazine, Israel's ambassador to the U.S. Michael Oren said that the establishment of a Palestinian state (h"v) could alter the status of all existing agreements between the Palestinian Authority, the U.S. and Israel. According to Oren, Israel has agreements with the P.A., not with the 'government of Palestine'. Agreements that could be "put at risk" include treaties on security cooperation, economic and even water-sharing. "The Palestinians risk all that has been achieved if they go forward with this...and that would be a great tragedy," Oren said.